For prevention of pneumonia caused by myco-plasma hyopneumoniae infection. 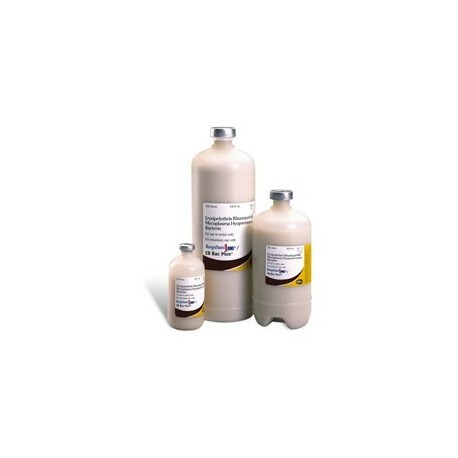 Contains unique new oil-in-water dual-action adjuvant, Emunade, for faster acting, longer lasting protection, less tissue reaction, and excellent syringe-ability. Dosage: 1 cc SQ at 7-10 days of age or older, repeat in 2 weeks. For vaccinating healthy pigs and pregnant sows against chronic pneumonia caused by M. hyopneumoniae. Pigs should be given the first dose at approximately 1 week of age and the second dose 2 weeks later. Pregnant swine should receive their primary doses at approximately 6 weeks and 2 weeks before farrowing. Dosage: 2 cc administered IM. 21 day withdrawal. The first myco-plasma vaccine with single dose administration and 23 weeks duration of immunity with the adjuvant Ampligen. For best results, vaccination of all swine in the herd is recommended. 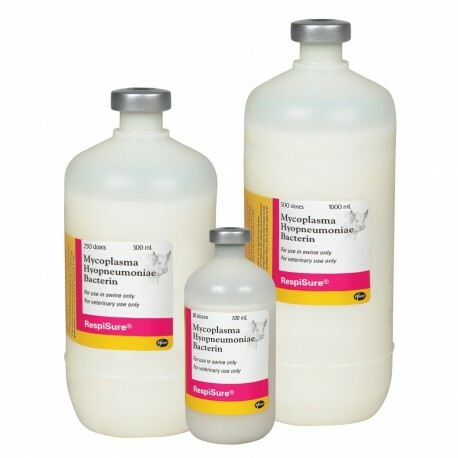 Common in growing and finishing pigs, mycoplasmal pneumonia is a widespread, chronic disease characterized by coughing, stunted growth and reduced feed efficiency. 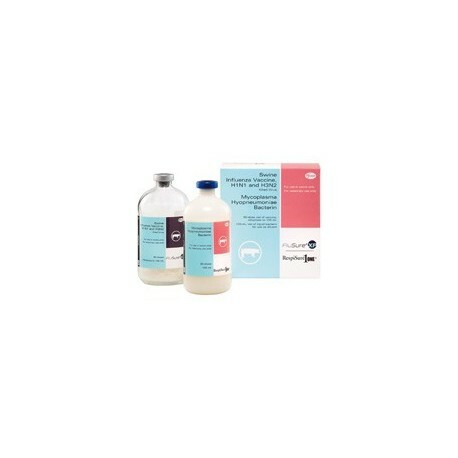 For the vaccination of healthy, pregnant swine as an aid in passive maternal immunization of their pigs against neonatal diarrhea caused by C1 perfringens Type C & E. coli bacteria. 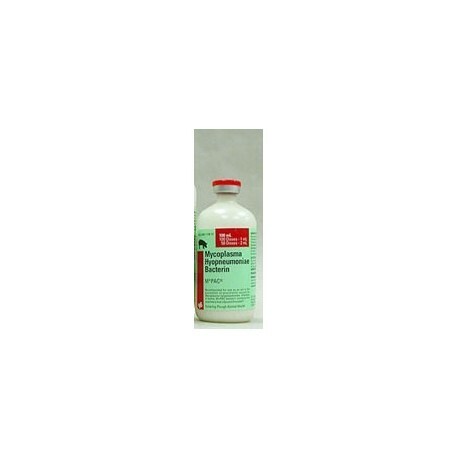 Dosage: Administer 2 ml IM or SQ to pregnant sows and gilts. 3 weeks apart during last half of pregnancy with second dose given at least 2 weeks prefarrow. 21 day withdrawal. 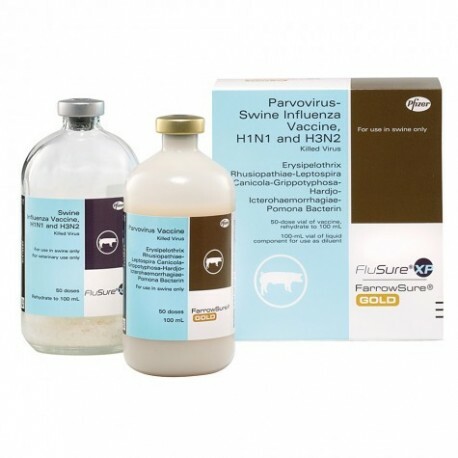 For vaccination of healthy breeding swine, including pregnant sows and gilts, as an aid in the prevention of disease caused by Swine Influenza virus subtypes H1N1 and H3N2, Parvovirus, Erysipelas and the 5 most common strains of Lepto. For vaccination of healthy breeding swine as an aid in preventing reproductive failure caused by porcine Parvovirus, Erysipelas and the 5 most common strains of Lepto with Bratislava and the added protection against H1N1 & H3N2 swine influenza. 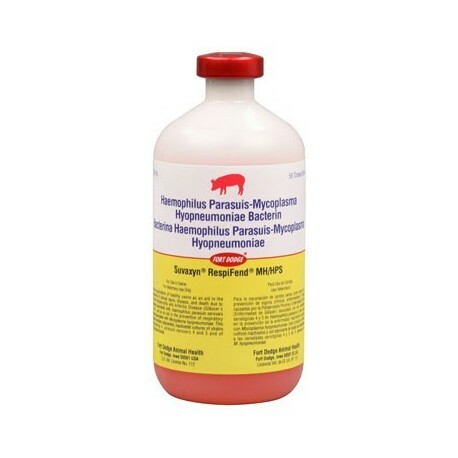 For vaccination of healthy swine 3 wks or older, including pregnant sows and gilts, as an aid in preventing respiratory disease caused by Swine Influenza virus subtypes H1N1 and H3N2, and Mycoplasma hyopneumoniae. A 10-wk duration of immunity following vaccination has been demonstrated against SIV H3N2. Dosage: Two 2 ml IM doses administered 3 wks apart. 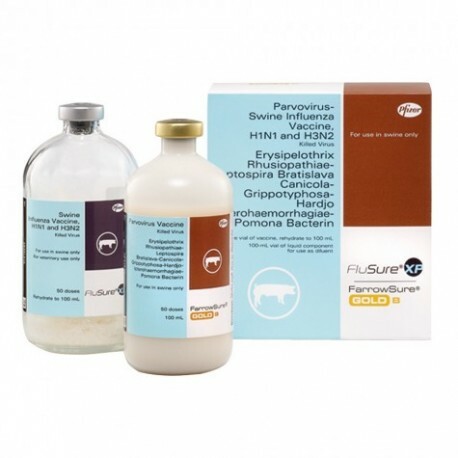 For vaccination of healthy swine 3 wks or older, including pregnant sows and gilts, as an aid in preventing respiratory disease caused by Swine Influenza virus subtypes H1N1 & H3N2, and Mycoplasma hyopneumoniae for a period of 25 wks. 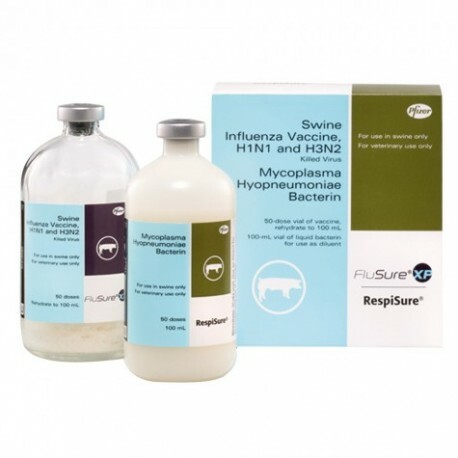 For vaccination of healthy swine 3 wks or older, including pregnant sows and gilts, as an aid in preventing respiratory disease caused by Swine Influenza virus subtypes H1N1 and H3N2, and Mycoplasma hyopneumoniae for a period of 25 wks, and Erysipelas caused by E. rhusiopathiae for a period of 20 wks. 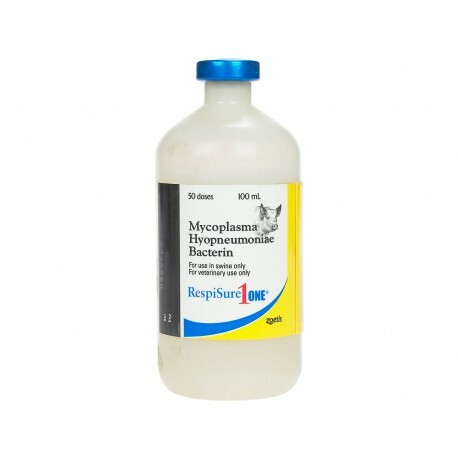 For vaccination of healthy swine 3 weeks of age or older as an aid in preventing erysipelas caused by Erysipelothrix rhusiopathiae for a period of 20 weeks and respiratory disease caused by Mycoplasma hyo-pneumoniae for a period of 23 weeks. 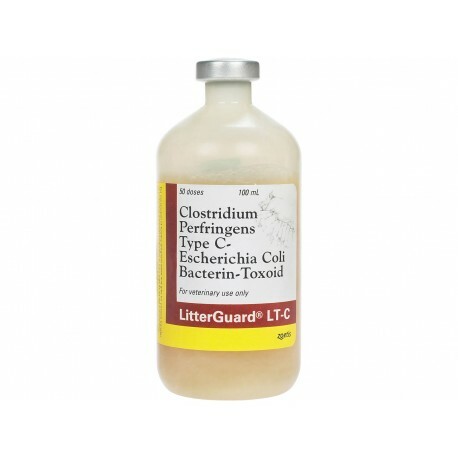 For use in healthy pregnant swine for prevention of E. coli plus clostridium perfringens in baby piglets. Dosage: 2 cc IM given 5 and 2 weeks prior to first farrowing, with a single booster to be given 2 weeks prior to subsequent farrowings. 21 day withdrawal.